I did it. Yes, I did it. I am making my entry to the KitchenAid India contest. Generally, I do not participate in any contests / events owing to my hectic job schedule that never provides me the spare time needed to participate in such events. Luckily, this time I got some enthusiasm from fellow bloggers and friends who motivated me to try something new. 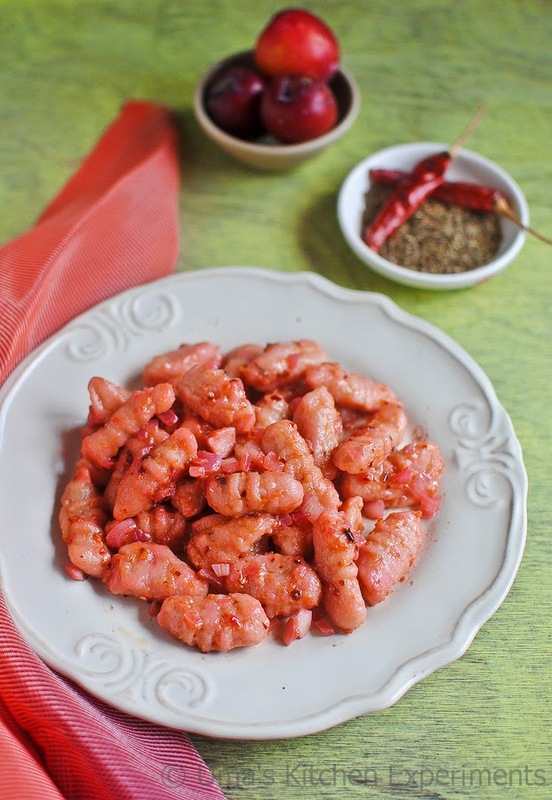 The moment I came to know the preparation of gnocchi, I was waiting for an apt time to try it. Thought it is a bit time consuming process, its worth a try as at the end you would get the happiness of seeing a delicious, creamy, shiny gnocchi, made by you from the scratch.When IFBM announced their first contest and they said it is a "Plum Challenge", my mind was thinking about making desserts though my heart really didn't vouch for the idea. 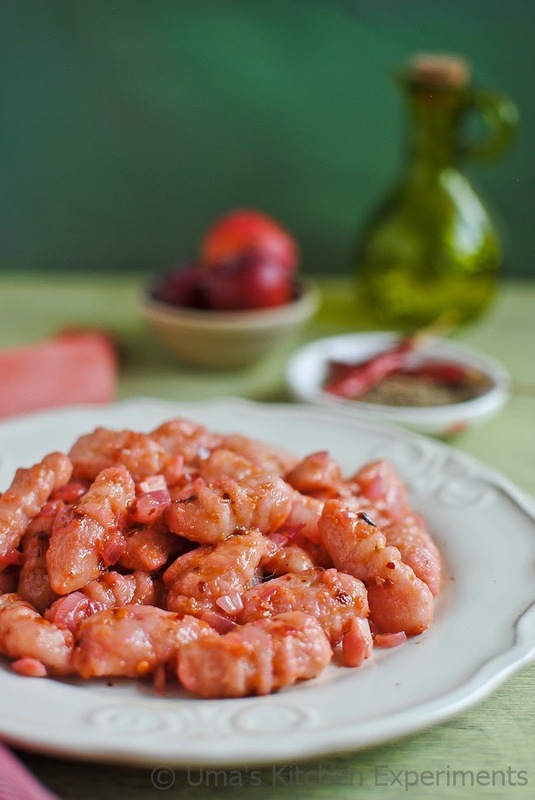 Making gnocchi using plums was a sparse thought and called up my husband last Monday while at work, asking him to buy some plums on his way back home. I got sweet and sour Indian plums yesterday. I picked one to see how it tastes and ended up eating few of it. It was sweet initially but started tasting sour towards the end(near seed). So I decided to prepare a spicy sauce for gnocchi to go with both sweet and sour taste. At the end, I felt spicy and a bit of sourness in taste which was a great combination. I liked the inviting color of the dish which was very appetizing. I cooked gnocchi in three batches and again mixed the sauce in three batches. 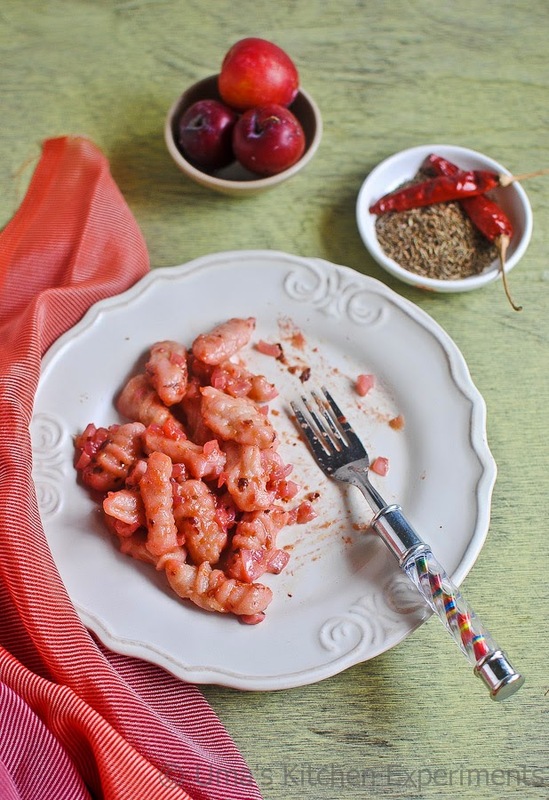 I tried plum gnocchi's with tomato based sauce, creamy buttery sauce and this thin plum sauce. 1) Preheat the oven to 200C. Spread the plums over the baking tray and drizzle some oil over it. Roast it for 15 minutes or till it becomes soft. 2) Cool a bit and blend only the plums to a smooth paste. Don't add water. 3) Take a mixing bowl, mash potato. Don't over mash it but make sure there are no lumps. 4) Pour the pureed plums over it. 5) Add 1/2 cup of flour, start mixing it and make a dough. Keep adding flour in batches to get a nice, moist dough which doesn't stick to your hands. 6) Divide the dough into 3 logs. Again divide each log into 3 and roll it as pile or thinner log. Dust more flour to make the job easier. Cut the log into several pieces using knife. Repeat the steps for other logs. Use flour generously as it helps to get perfect shaped gnocchi. 7) Now using a fork, shape the gnocchi. Starting from the upper end of the fork, gently press towards down to get the ridges. It tends to roll as you move on. If it doesn't, gently make a roll of it. Arrange it in a flour coated plate. No worries, if you are not able to do this perfectly. Directly use the cut pieces of log. Repeat the steps for all the pieces individually. 8) If you've completed shaping the gnocchi's, boil water in a saucepan. 9) When the water from the sauce pan is boiling, add the gnocchi's one at a time and cook it. Cook it in batches if required. 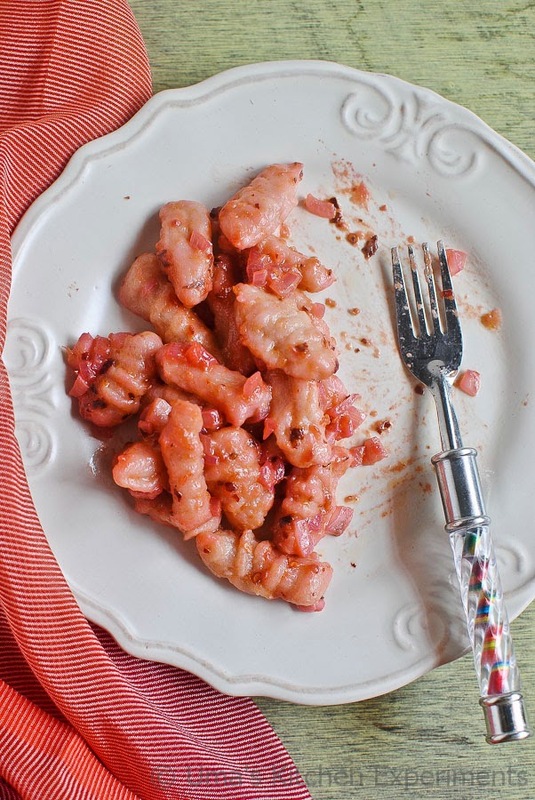 Do not add too many gnocchi's while cooking, as it may stick with each other. 10) In about 1-2 minutes, the gnocchi comes to the surface and floats on the top. Remove it immediately using a perforated ladle. Depends upon the size of gnocchi, the cooking time differs, but generally it comes to the surface of boiling water once it is cooked. 11) Cool down. Meanwhile, prepare the sauce. 1) Heat butter in a pan. When it starts melting, add finely chopped onion and garlic. 2) Saute till both become soft and translucent. 3) Add crushed red chilli flakes and salt. 4) Add pureed plum along with 1/3 cup of water. 5) Let it cook for few minutes or until you get the required consistency. I waited till it reaches semi gravy consistency. 6) Reduce the flame and add the cooked gnocchi. Gently mix well so that the sauce coats to the gnocchi well. 7) Garnish with some cheese and serve it hot. 1) The plum juice/water which we get while roasting can be used in making the sauce instead of adding the puree and water as said above. But discard if you find the taste too tart. 2) The plums I used are ripe, sweet and little sour. 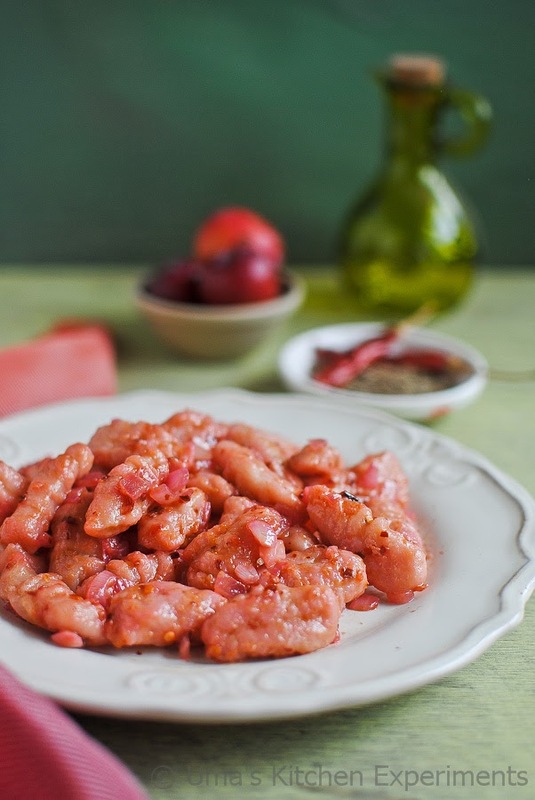 If the plums you are using are sour, adjust the red chilli powder accordingly. 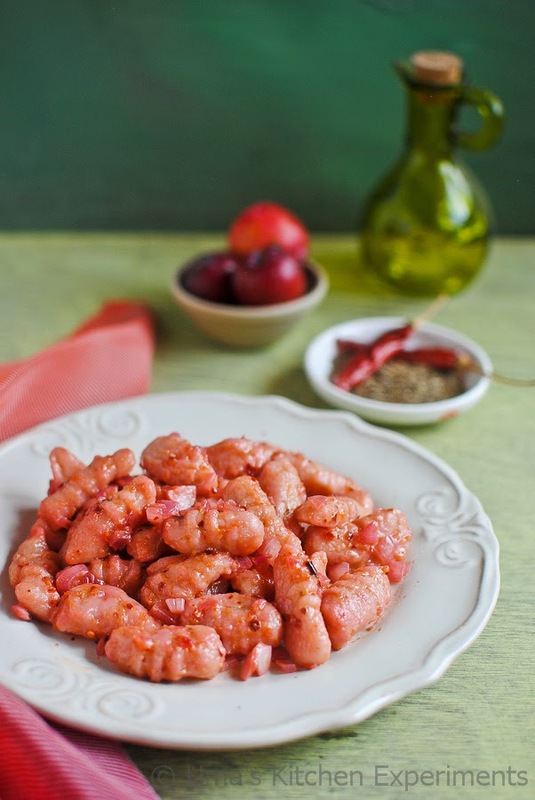 3) You can choose any kind of spicy sauce for the above described gnocchi. 4) Instead of baking the plum, you can also pan roast it till it becomes soft. 5) The sauce quantity is for the given gnocchi measurement. Feel free to increase / decrease it according to the taste of plums and personal preference. 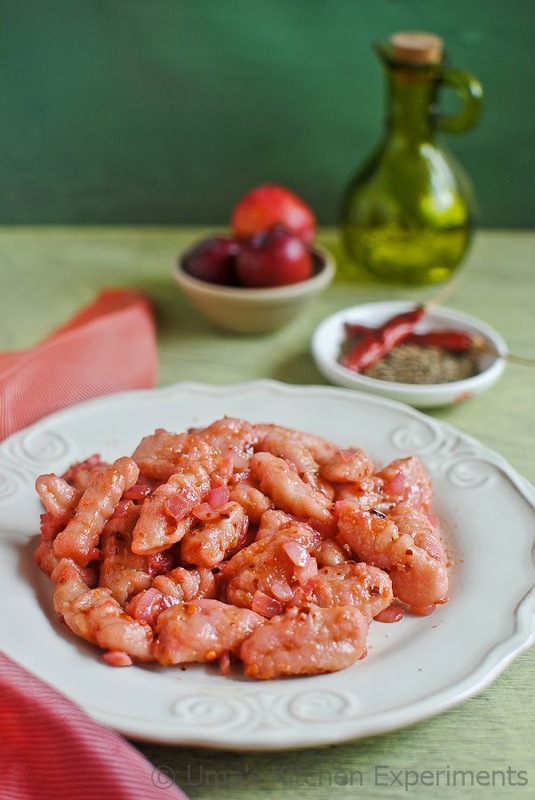 Real nice looking roasted plum dish. Excellent preparation.